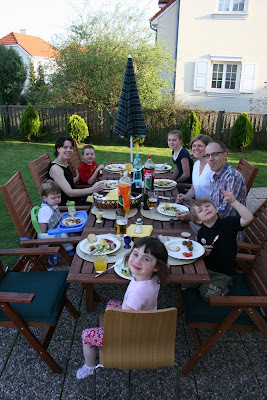 What do you get when you mix two expatriate families, gorgeous spring weather, a turkey and some herring? A unique Easter Eve smorgasbord a la fresca! 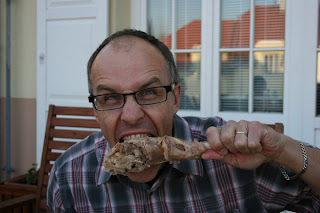 Admittedly... turkey and herring don't usually go together. But when you combine a Butterball Turkey with Swedish Meatballs, lingonberries, boiled potatoes and cream sauce, (oh yeah - and a couple bottles of pickled herring) the result makes for great Swedish-American eatin! Even here in the middle of Central Europe, good Scandinavian Cuisine is only as far away as the neighborhood IKEA (correctly pronounced "ee-Kay-ah", by the way). Did I mention there was a trampoline in the backyard? And barbequed chocolate-stuffed banannas for desert? Jad: "I liked the meatballs and the gravy!" Danna: "I liked jumping on the trampoline. And also I liked the meatballs!" And the turkey? I think we have at least one new Swedish fan of this American bird! I've always thought that running is a great way to work out a cold. Perhaps so... but maybe not running for 13.1 miles. 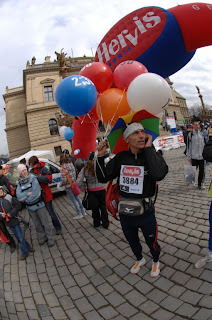 I've been "run-commuting" to work most of the past year - (it's uphill both ways, by the way), and thought I would shoot for Prague's annual half-marathon. Training was going well - distances slowly increasing each week, and miles piling up. Then the "Prague Spring Sickies" hit... in the middle of our ski vacation. Bummer. Not that I was particularly surprised... (yeah, we did it last year too). Being a polite family, we believe in sharing bugs & viruses just as well as toys & books. So - once Kyler and I were done with our nasty-old-cold-flu-icky-illness, we passed it on to the "big kids" and Erin. Who passed it back to me. Just in time for the half-marathon! No problem - nothing that a good dose of Ibuprofen on race day can't take care of, right? Which brings me to the balloons - the race was very well organized - and included pace runners - runners whose goal was to run the race at a set pace - 1:30, 1:50, 2:00, 2:10, etc. Each pace runner carried helium balloons marked with the time they were running. President Klaus shot the starter's pistol, and we were off - all 5000 of us! My sights were set on the white 1:50 balloons, bobbing just a couple hundred yards in front of me. For a while, they were right there... just... out... of... reach! And then the meds wore off and things (other than me) started going rapidly downhill! Before long, the balloons were chasing me! When my dreams of sub-two-hour glory ran by in a black track suit, I knew I was in trouble. A couple kilometers later, a grandma carrying the 2:10 pace balloons sped by. I'm pretty sure I saw a three legged dog ease by shortly after that, followed by a sloth. The winner finished in just over one hour, and didn't appear to be breathing all that hard. When I crossed the finish line in two hours 15 minutes, all I wanted to do was go home and curl up on the couch for a day or two. Official result? 3,837th place. Next year, I'm shooting for 2,000th... and those white 1:50 balloons? They're mine!